With Nintendo’s latest Labo kit, users can now code their own virtual reality games in an almost silly LEGO kind of way. 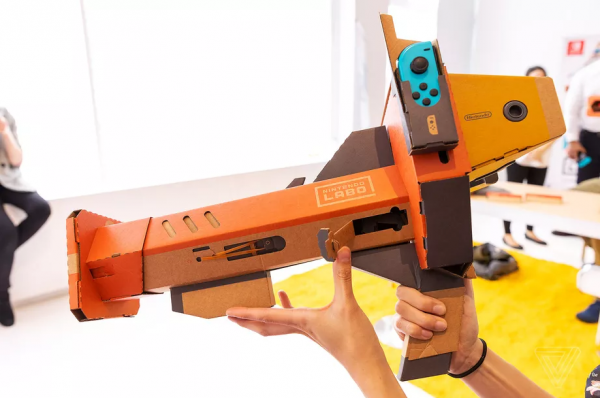 Nintendo just released a DIY cardboard accessory kit for Switch less than a year after the launch of its original Labo kit. 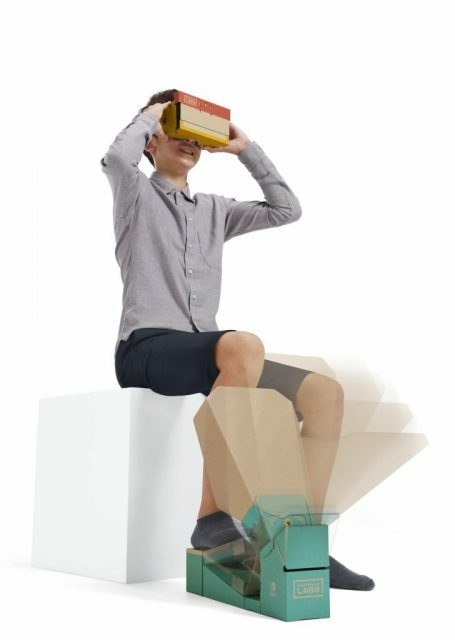 The new VR kit is a fun introduction to virtual reality for kids and adults and is a re-imagination of virtual reality experiences through simple and shareable “minigames” that have been designed to get many people playing and interacting with virtual reality. All of these minigames must be played with the headset held close to the face and there are pros and cons to this. 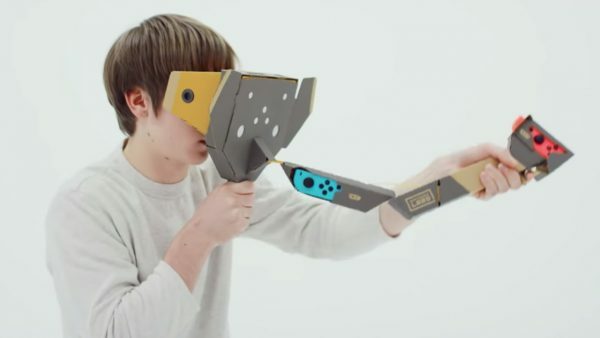 For kids, holding the Switch screen up to their faces for long can be tiring but on the positive side, the minigames on the Labo kit that have been designed to be played in turns and it is therefore a lot quicker to pass the screen around than have to deal with the fuss of taking your headset on and off. Passing the headset around among players also helps in encouraging virtual and real-world interactions. There are a total of six Toy-Con creations which can be made with the Labo kit. These include the camera, blaster, bird, elephant and a single pair of virtual reality goggles. To get the virtual reality experiences, you have to combine the VR goggles with the rest of the Toy-Cons. By slipping into each of the Toy-Con peripherals, you can unlock a world of exciting virtual reality experiences such as going underwater and taking snaps of the underwater creatures or simply being a bird. 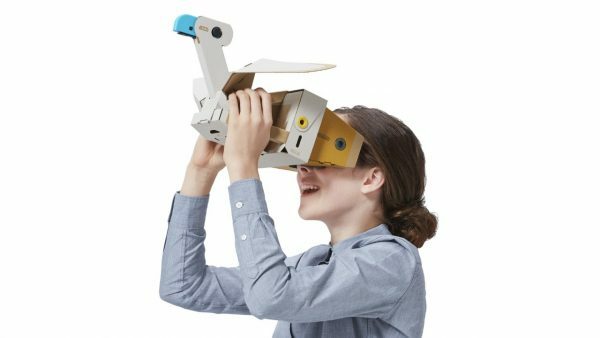 The Nintendo Labo VR kit is made from a plastic material and glass lenses. Apart from the rubber bands and IR stickers, they are the only non-cardboard components of the kit. 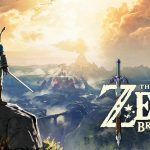 The goggles will bring the Switch’s 720p resolution screen very close to your face. 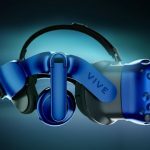 Don’t expect a Vive or Oculus-quality resolution. The goggles are quite blurry although this will not necessarily dent your enjoyment of the minigames. 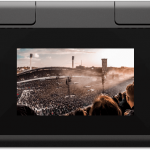 The virtual images will be displayed in a stereoscopic 3D with the menu items floating in the screen in a 3DS-like display. The minigames in the Toy-Con creations have been designed for virtual reality but you don’t necessarily have to use the VR goggles to view them. 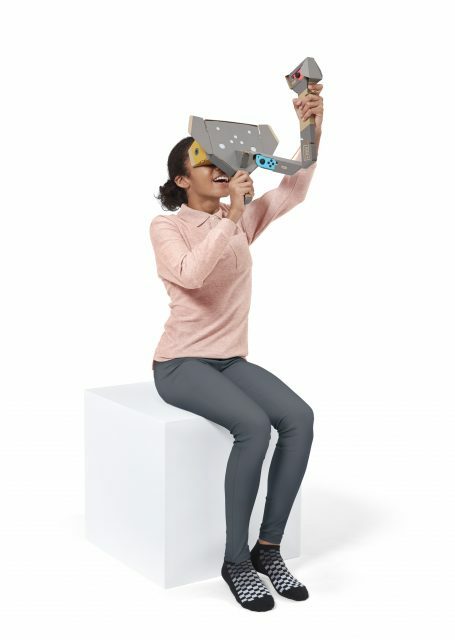 You can simply choose to switch off the VR and view the games in 2D instead of 3D by using an included Screen Holder which is another Labo component that you will need to learn to assemble. The blaster is the most complex to assemble of all the Toy-Con creations that have so far been released since it has plenty of moving parts. It may take a few hours to put together. The blaster has rubber bands that will hook and release when the player loads them and pulls the trigger. In one of the games in the blaster, the user has to defend against an alien invasion. Yet in another blaster minigame, the players can take turns aiming and shooting food into the mouths of hippos so as to lure them to move onto one side. The player with the most hippos will win the game. It feels like a less frantic version of the Hungry Hungry Hippos. The Toy-Con Elephant is the best looking of the peripherals. 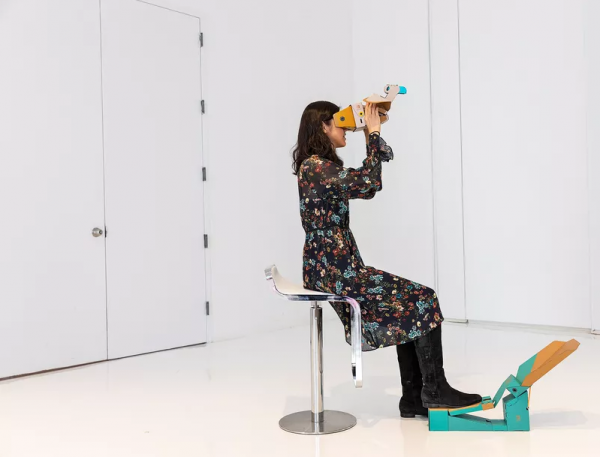 This piece also has a Toy-Con version of a virtual reality creation app that’s similar to Google’s Tilt-Brush. In the Doodle minigame, you can use the elephant’s trunk as a paintbrush and move around a 3D paintbrush. Like other bunches of peripherals, it also comes with several minigames that you can try out. While it carries the moniker ‘elephant’, it doesn’t really have any elephant-related games that you can play. 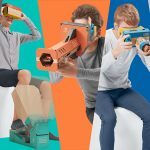 The Labo Kit’s virtual reality elephant and trunk however make for a unique and great control scheme for the VR kit. The mask has IR stickers which assist in tracking the two controllers which have been placed in the elephant’s trunk. It makes for a unique but fun configuration that suits this Toy-Con perfectly. 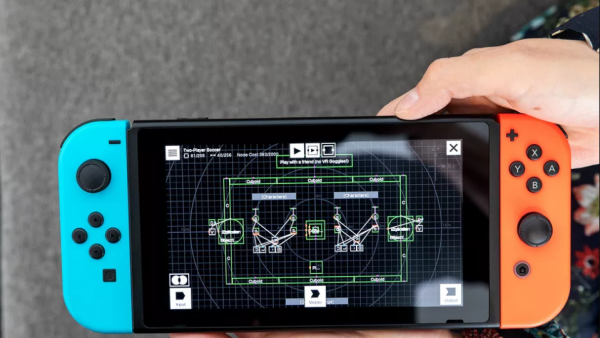 You will also appreciate the physics-based minigame called Marble Run where the player can set up puzzles and then pass the headset over to a friend to solve. Players can use their cameras to go underwater and shoot fish photography or to take snaps of a Tamagotchi-like character similar to the one from the House game that was in the initial Labo variety kit. In this Toy-Con, the controller is transformed into a bird’s face and the player puts their face up to the rear end of the bird and flaps their wings repeatedly as they soar across an island. Watch out to avoid knocking your head on the plastic headset as you flap the bird’s wings on this magical flight! By stepping onto the wind pedal, the player can deliver extra speed as they play a timed challenge in the Bird Dash mode. Stepping on the pedal will also send a gush of wind rushing to your face thereby adding an extra immersion factor in the minigame. You will also appreciate the Hop Dodge minigame with this Toy-Con where you will bounce on a trampoline as you try and hit the highest heights while avoiding obstacles. The game is quite simple but also fun and exciting. 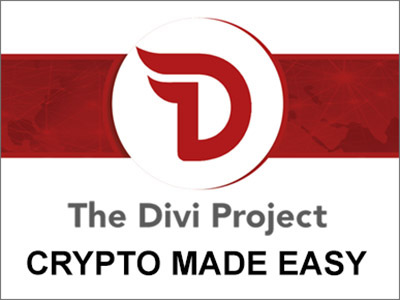 While the games are fun, they don’t offer you the levels of complexity, immersion and gameplay that you’d experience with a premium virtual reality headset or with mobile or PC gaming. An adult or an experienced kid player is likely to get bored pretty fast after going through a few rounds of plays. Small kids might enjoy it for longer, though. 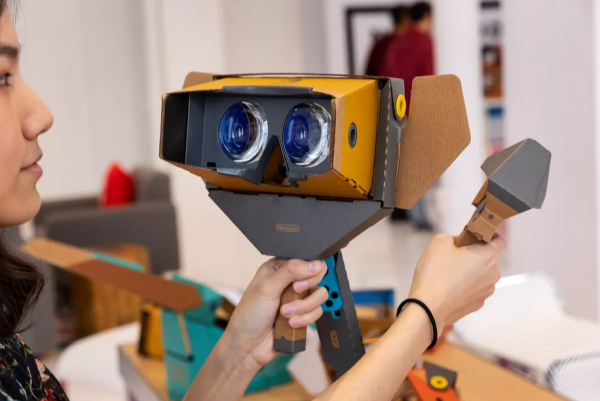 The strongest point and real fun with the Labo VR Kit comes in the actual building process and in the Toy-Con Garage platform. The programming platform is a logical if-this-then-that coding matrix that allows the players to mix and match the disparate Toy-Con creations and remix the multiple ways in which they can be used. A good example is when coding the guitar codes on Toy-Con Garage to the minigame Rainbow Connection which can be quite challenging but you will have a jaw-dropping moment once you enter the Toy-Con Garage VR mode and have a look at the backend of the games. There are 64 extra virtual reality minigames that have been built within the Toy-Con Garage. 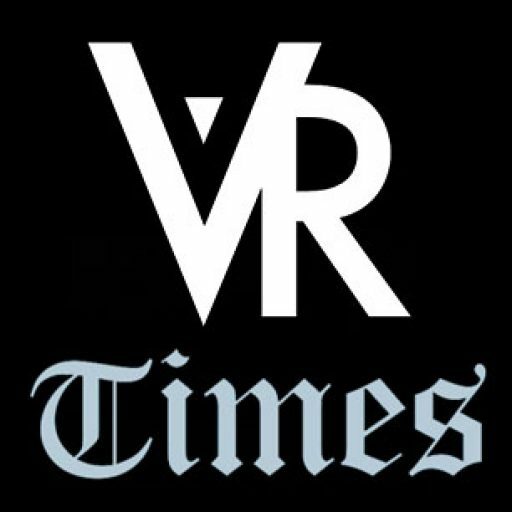 These games serve as launching points for players that want to build their own virtual reality games such as editable and customizable blueprints. Players can even swap out a ball that is in a soccer game for an apple which of course will transform the physics of kicking along the new apple ball. The range of options available to players in the input, middle and output nodes is simply mind-boggling which adds to the challenge. In spite of relative simplicity, the VR kit has a lot to offer and you only experience it all when you take some good time fiddling with seemingly limitless options. 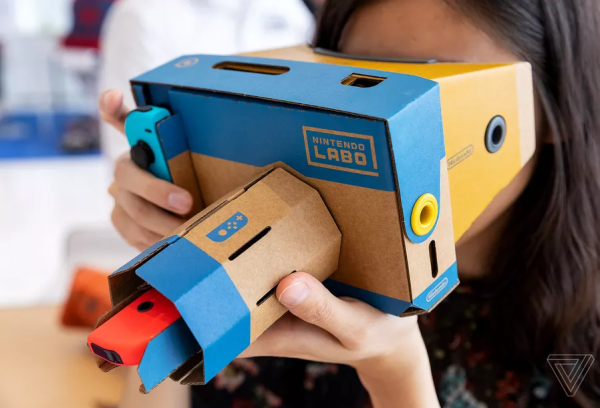 The entire Nintendo Labo VR Kit is available for purchase for only $79.99. 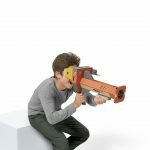 If you are looking for a more stripped down version with fewer cardboards, you can go for the Nintendo Labo VR Starter Kit + Blaster which goes for $39.99 and then incorporate the expansion sets later on if you wish to. The VR Kit will be available for purchase in stores and online from April 12th.